Here’s one of our family’s most favourite dishes for dinner. You can’t image how my kids like eating stewed chicken wings with mushrooms. Whenever I cook this dish, my kids will finish a big bowl of rice with the yummy chicken wings and sauce. The best dried mushrooms are thicker and bigger in size with sweet aroma. Try to find the mushrooms with best quality. It’s worth every dollar. Soak mushrooms until softened. Trim the stem, julienne or cut into halves as you like. Peel carrot and roughly chop into bite-sized pieces. Blanch chicken wings in boiling water to remove the blood. Drain well. Marinate for at least 25 minutes. Heat cooking oil over medium heat. Sauté mushrooms for a while. Set aside. Add more oil and sauté ginger and shallot over high heat until aromatic. 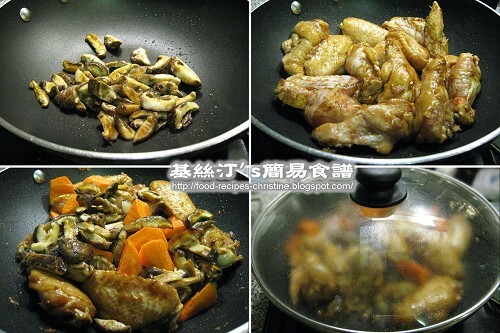 Add marinated chicken wings and stir fry until lightly brown. Toss in mushrooms and carrot and stir fry. Pour water together with the marinade over the ingredients and cook with a lid. Bring it to a boil. Simmer until chicken wings and carrot are cooked through, about 20 to 25 minutes. Don’t overcook the chicken wings, lest the chicken meat would fall apart. Add thickening and cook to your preferred consistency. Dish up. Serve with hot rice. I can't see the photo! What happens? Your kids sound like a gourmet to me! The mother must be a strong influence in their life. This dish is very simple and yummy. Thanks for letting me know of the displaying photo problem. I've fixed it. Should be no problem now. This dish just looks yummy, easy and just mighty tasty - look forward to trying. I cook this a lot too =) And I agree with you, quality mushrooms are worth every penny! The gravy must be fantastic! I could eat a big bowl of rice just with this one dish! 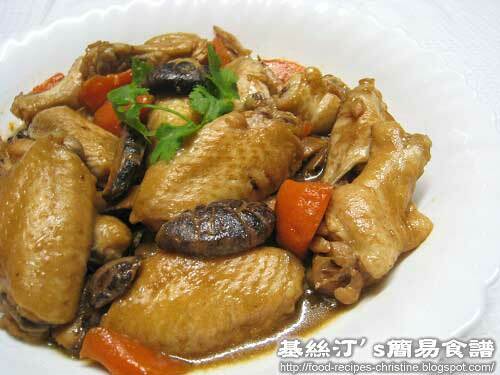 MMMMMMMMMMMMM,.......what a lovely & very tastefull chicken dish! Firstly, congratulations on your award. You have presented a yummilicious treat! Made this recipe for lunch today. It was lovely, simple and delicious! Hi Christine, thank you for all your lovely recipes! Is it possible to substitute or omit the chicken powder? I can't find chicken powder without added MSG where I am. Sure, you can just skip the chicken powder. It still works.